Well hurrah, we have great news today for those of you waiting for a release announcement and unveiling for the Samsung Galaxy S3 (S III) as it seems almost certain that it will be unveiled at a Samsung event on May 3. The event is to be held in London, invitations have now been sent out and Samsung has confirmed the next Galaxy device will appear so now it’s time for Samsung to impress us. The idea of the Galaxy S3 arrival has had many people’s mouths watering for some time and although there was previously news of a May 22 event it appears this was inaccurate. Invitations for the May 3 event are now being received by tech websites, embellished with the words, “come and meet the next Galaxy S.” Although this doesn’t specifically say the Galaxy S3, we think the likelihood of it being for anything other than Samsung’s flagship device is practically zilch. The details were brought to our attention by The Next Web and Dutch website Tweakers has already received its invite. 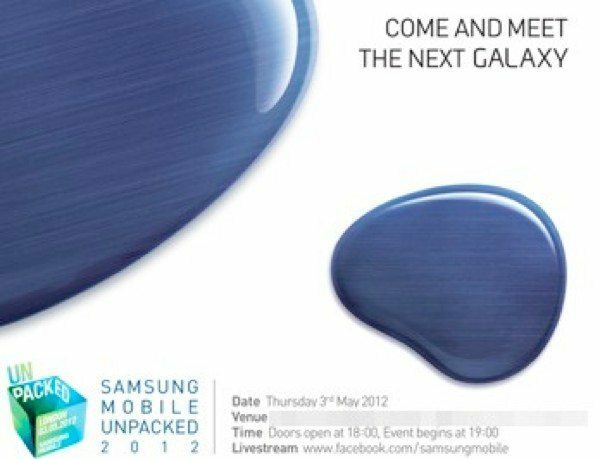 The occasion is shown as Samsung Mobile Unpacked 2012 on May 3, and the time is 18:00 GMT with the event starting at 19:00 GMT (2pm ET or 11am PT). As well as this there are details of a livestream at www.facebook.com/samsungmobile given on the invitation. Engadget is showing an image of the invitation with the times clearly displayed although the venue has been blanked out. We know just how many of our readers are avidly waiting for the release of the Galaxy S3 from the many comments we receive in response to our S3 articles so mark May 3 in your calendar and hopefully on that date we’ll be finding out an exact release date. We’ve posted numerous articles now on the Galaxy S3 and hope we’ve succeeded in giving readers some idea of what is expected. Of course none of the details are yet confirmed but leaks and rumors usually give us at least some accurate details. Commonly anticipated specs and features for the S3 are an Exynos quad-core processor (either 1.5 or 1.8GHz) 4.6-inch Super AMOLED Plus HD display, 10 or 12-megapixel rear camera, LTE connectivity, 2GB of RAM and 32GB of internal storage and the Android 4.0 ICS operating system and we’d be surprised if most of these are not fulfilled with the next Galaxy S smartphone. However we’ve already spoken about the possible disappointment of the Galaxy S3 (and iPhone 5) not living up to expectations so let’s hope that Samsung has its finger on the pulse and can deliver the goods. Roll on May 3 then when we’ll be bringing you all the news from the event and we should at last have official details of the Galaxy S3. It’s certainly ‘impress me time’ then but what we’d like to know from you is what the Galaxy S3 will need to include to impress you? Do you think the next flagship Samsung smartphone will fulfill your wish list? Send your comments to let us know. the event is on May 3rd, the invite has 3 ‘designer’ blobs, methinks the SIII will be revealed.